It's been a long time since I have raised chickens, and never with out a broody hen, but I am confident in myself. The past few months have been spent researching brooders, and I think I have come up with a pretty good design. I will have photos posted as soon As I have finished with it, I just need to finish a few things. I am pretty excited, as well as my friends, raising chickens in the city is not unheard of, but is still new to most people. 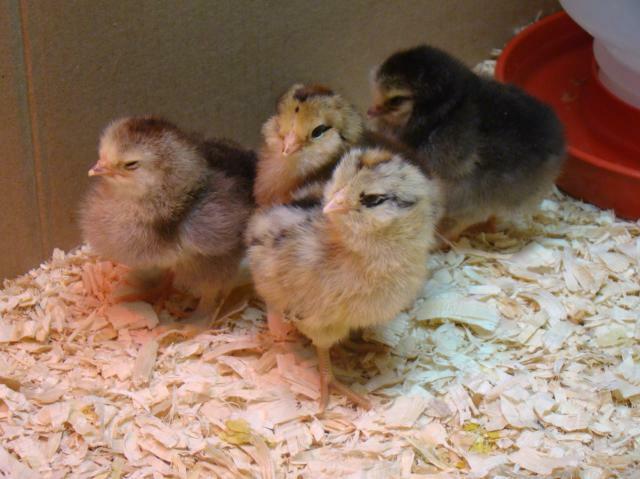 I can't wait till they arrive, 6 little peeping fluff balls of cuteness. 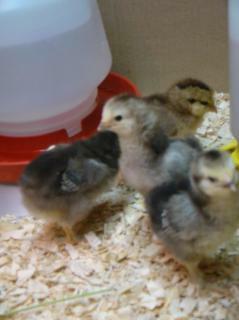 My Babies arrived today, sadly one did not make it, one of the Easter Eggers. But on a happier note, the other 5 peeps are doing just fine. There in there new home, and peeping and running around. This Photo was taken the day they arrived, so small and so cute. It's been 3weeks now, and the peeps are growing and growing. There starting to feather out, so every day there changing, loosing more of there fluff and gaining more feathers. My two easter eggers seem to be feathering much faster then my light brahma's, but I'm sure that's all due to bread. This has been one of the most exciting adventures I have ever undertaken. This weekend I will be working on the conversion of an old detached garage into there new hen house. good time will be had by all im sure..
Over a month has passed, and we now have our Five hens in there new home outside. They love all the room they have and love to run around my back yard. I have to say I am very lucky, all of my neighbors are very supportive of my hobby of raising chickens and are looking forward to some fresh eggs. I tend to spend more time outside now, I love watching them, there very interesting birds. Right now there establishing there pecking order I think, so its a amusing to see them all react to each other. There all a but skittish with me still but I have on hen "Molly" who will let me pick her up as long as there is a bit of melon or squash involved. I'm posting some new photos soon, so Please check them out. The girls are getting bigger and bigger, they have taken to there new home well, and I keep it well lit and warm fro them. It's been a wonderful time raising them, on the farm the mother hens would take care of the chicks, but now it's my turn, and I have to say I'm rather proud of myself. As the weather here starts to get colder and colder, I keep trying to come up with ways to help keep them warm, I have a heat lamp over there roost, and will be adding a water warmer to stop there water from freezing. If anyone has any other Great ideas please let me know.